Automakers and suppliers were hit hard in the third quarter while car retailers continued to make gains, according to the Automotive News Europe PricewaterhouseCoopers Transaction Services Shareholder Value Indices. Five consecutive quarters of growth for automakers came to an end with a 10.6 percent decline in shareholder value in Q3. Growth peaked in Q3 last year at 18.0 percent but has halved in each quarter since then. Suppliers were down 11.5 percent in Q3. This follows the 0.7 percent fall recorded in the second quarter of this year, which was the first decline since the third quarter of 2012. The retail sector, which in Q2 this year had recorded its first decline since 2011, reversed the trend with a strong 10.0 percent increase in shareholder value. The setback for automakers and suppliers came in a quarter when main European stock markets were relatively stable and U.S. markets, as reflected by the Dow Jones Industrial Index and the S&P 500, gained close to 10 percent. Fiat was the only automaker to achieve growth in the third quarter this year, up 6.0 percent. This followed a 14.7 percent decline in Q2. 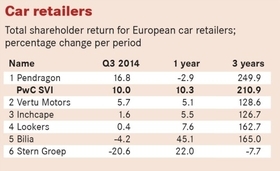 Losses in shareholder value for other firms ranged from Peugeot’s 5.9 percent decline to Renault’s 13.1 percent dip. Each company has specific reasons contributing to these setbacks. In Renault's case, for example, its significant stake in Russia’s largest automaker, AvtoVAZ, created concern in light of the potential impact of sanctions on the Russian market. VW, which fell 13.0 percent, was affected by recalls of more than 1.1 million cars in North America and China and the recall by its Audi subsidiary of 70,000 cars over brake issues. However, the biggest factor by far for the entire sector is growing concern that the long-anticipated recovery in Europe’s vehicle sales will be both slower and weaker than expected earlier in the year. "The combination of model-specific recalls and macro concerns about the pace of recovery in a number of key European markets hit automakers hard in Q3," PwC Automotive Transaction Services Partner Jason Wakelam said. "This was despite overall volumes continuing to increase." 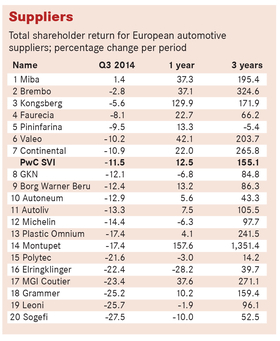 Most suppliers tracked by ANE and PwC experienced losses in shareholder value during the quarter. The one exception was Miba, the Austrian-based producer of sintered components, engine bearings and friction materials. The losses ranged from 2.8 percent for brake specialist Brembo to 27.5 percent for filtration and suspension systems specialist Sogefi. Miba's spread of activities has allowed gains in certain sectors of the industry to offset downturns in others. Sogefi's fortunes were affected negatively by restructuring costs and a sharp slowdown in the Brazilian market. 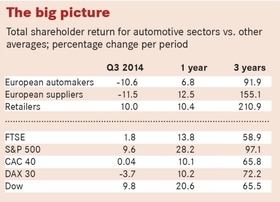 "To a large extent, the fortunes of suppliers follow those of the automakers. Some suppliers have been impacted by automaker plant closures across Europe (such as Ford, PSA and GM), together with slowdowns in emerging markets,” PwC's Wakelam said. Most listed retailers remained in positive territory in Q3. UK operators led the way: Pendragon was up 16.8 percent and Vertu Motors increased its value to shareholders by 5.7 percent. Both continued to perform well in a buoyant domestic market. 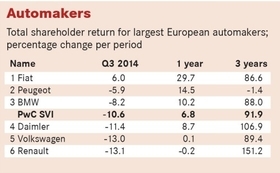 “Market confidence in the UK remains higher than other key European countries," said PwC's Wakelam. Stern Groep, however, declined 20.6 percent, with the poor performance of its Ford outlets affecting profitability. In the preceding quarter, Stern, the largest dealer group in the Netherlands, had gained 41.4 percent following refinancing and improved Q1 profits.